Well, upon making this recipe I was not disappointed. They turned out beautiful and the flavor and combination of textures was perfect! 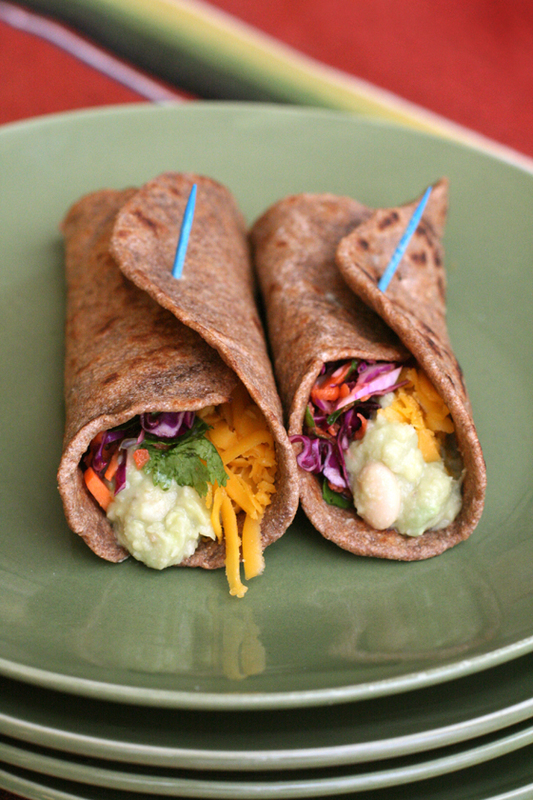 The white beans blend together perfectly with avocado, a vibrant red cabbage slaw adds crunch, and a little cheddar cheese completes these delicious wraps. Though we are not vegetarian, I have several delicious meatless recipes that are very economical and healthy even my meat-loving husband enjoys. (This is saying a lot if you know Kevin!) Meat is an important part of our diets according to Nourishing Traditions/the Weston A. 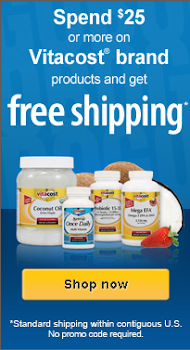 Price Foundation, but it's not essential to eat it every day and eating vegetarian meals a couple nights a week or for lunches is a great way to save money. I am always on the look-out for more great meatless meals and these wraps are a tasty new addition to my vegetarian menu. 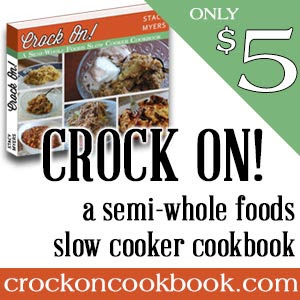 I decided to go all out with this recipe and serve it with my soaked whole wheat tortillas. I posted the recipe right before this one so if you'd like to make them just click here. 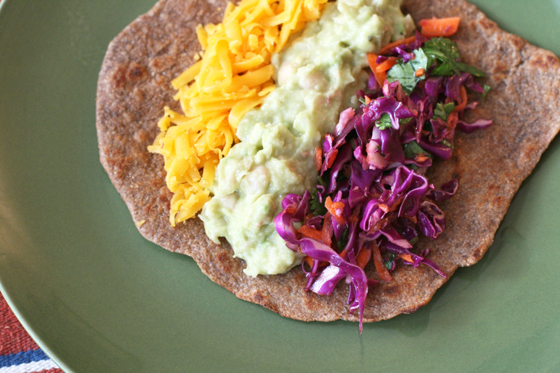 These tortillas are Nourishing Traditions approved so I wanted them on my blog, but admittedly this meal is a lot easier if you use store-bought whole grain tortillas instead. In a medium sized serving bowl, whisk together lime juice, olive oil, chipotle pepper powder and salt. Add the shredded cabbage, carrot, and cilantro. Stir to coat. *2 teaspoons finely chopped chipotle peppers in adobo sauce will work in place of the chipotle pepper powder. If you really don't like the flavor of chipotle you can substitute 1/4 teaspoon cumin or use 2 teaspoons salsa as Havilah did in her recipe. In a medium sized serving bowl, combine white beans, avocado, minced onion, and lime juice. With a potato masher or fork, mash together leaving some lumps and stir to combine. 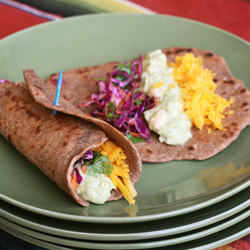 Spoon about 3 tablespoons each of red cabbage slaw and creamy white bean and avocado filling into each tortilla along with about 2 tablespoons shredded cheddar cheese. Preparation time (not including the time to prepare the soaked whole wheat tortillas): 15 minutes. Servings: 4. Beautiful photos, Melodie. You have a lovely blog. Now I am hungry and must go find something delightful and nourishing to feed the craving. :) Happy cooking! Keep sharing! We've made this 2 days in a row...we used navy beans, b/c that's what I had on hand. The first day we made romaine lettuce roll ups for the gluten free family members since I did not have tortillas for them. 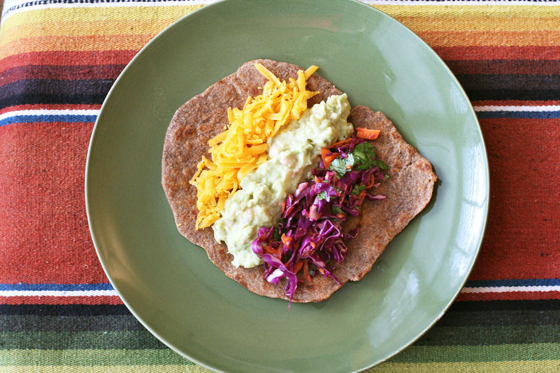 Yesterday I made it in a Trader Joe's low carb tortilla...so yummy! !